Caption slip reads: "Photographer: Emery. Date 1958-11-26. Reporter: Emery to RW. Assignment: $100,000 hardware store fire. 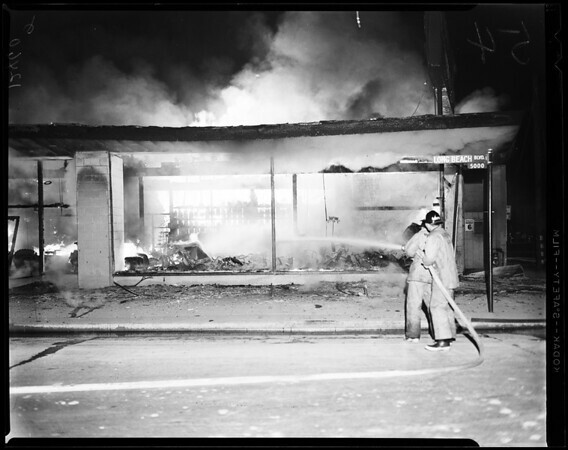 36/37/54/55/48: Long Beach city firemen working at fire which destroyed garden shop section of Dooley's Hardware Mart in 5000 block of Long Beach Boulevard 10:12p to midnight 11/25. Closeup two firemen on hose & nozzle: they have climbed to top of stack of barbecue motors (covered with tarpaulin) to fight fire."